How did the Tet Offensive influence society, politics, and military policy in the United States? The Vietnam War was fought between the Communist North Vietnamese and the Democratic South Vietnamese. Originally, a French controlled colony, Vietnam gained its independence after the battle of Battle of Dien Bien Phu in 1954. The 17th parallel with a demilitarized zone (DMZ) between had divided Vietnam in 1954 with the Geneva Accords. The North Vietnamese Army (NVA) and the Vietcong used guerrilla warfare and pitched battles to drive into South Vietnam. The South Vietnamese army, known as the Army of the Republic of Vietnam (ARVN), and the U.S. military protected South Vietnam while driving into North Vietnam, Laos and Cambodia. The U.S. aided the Democratic South Vietnamese with supplies and military advisors in the beginning of the conflict. It was not until the Gulf of Tonkin Incident that the U.S. was able to use military force in any means other than an advisory one. At the height of the war over half a million servicemen were active in that theatre of war. The U.S. goal of the war was to contain the spread of Communism in accordance with the Domino Theory foreign policy. At the beginning of the war between North and South Vietnam, the U.S. mainly provided supplies and military advisers. In 1964, an unprovoked attack on naval destroyers in U.S. recognized international waters at the Gulf of Tonkin caused the Gulf of Tonkin Resolution to be passed by Congress. This resolution gave the U.S. president, Lyndon Johnson, the ability to use military forces in Vietnam without formally declaring war. In 1968, the military command of North Vietnam planned a campaign that was to try to end the war in a single blow. The campaign comprised of elements of the NVA and Vietcong to strike military and civilian centers throughout the South. At the same time, the NVA and Vietcong were to help and engage an uprising with the civilian population of South Vietnam. 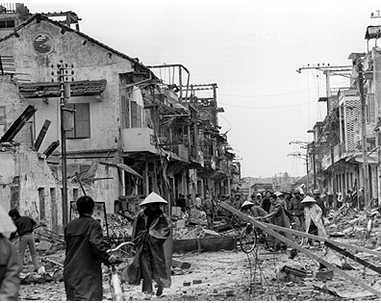 On January 31st, while under a ceasefire agreement during the Tet Holiday (Spring Festival), NVA and Vietcong troops struck over a 100 towns and cities. This complex and coordinated series of attacks became known as the Tet Offensive in the U.S. and the General Offensive and Uprising in Vietnam. Initially the U.S. troops and the ARVN were surprised and pushed back, but were able to regroup and counter attack in short order. The social uprising fared little better than the military assault, except to bring more numbers and safe havens to the Vietcong. 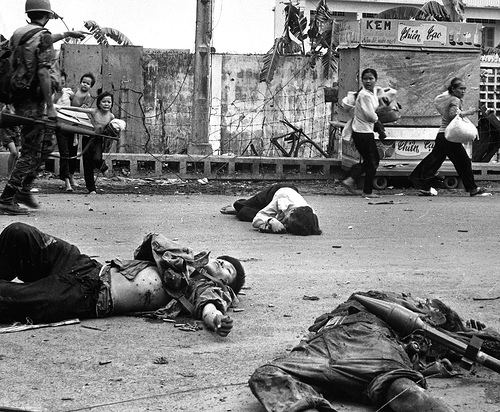 During the multiple phases of the Tet Offensive, the Communist forces and Vietcong lost over 85,000 troops. U.S. citizens and the media looked at the Tet offensive from a different point of view. While it was a disaster for the North Vietnamese and the majority of military objectives lay uncompleted, it was a blow to the morale and resolve of the U.S. and South Vietnamese. Shortly after the Tet Offensive, proposed peace talks began in Paris as well as the beginning of the withdrawal of U.S. military forces from South Vietnam. Within just a few years, almost all of the U.S servicemen in South Vietnam have been withdrawn, and only the ARVN is left to withstand the NVA and Vietcong. 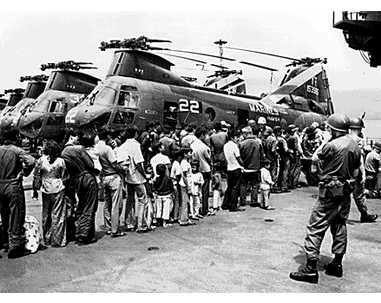 In 1975, South Vietnam surrenders to the North Vietnamese and the remaining U.S. personnel and South Vietnamese refugees were airlifted from the U.S. embassy in Saigon. Watch some Tet Offensive video at EncycloMedia.com. 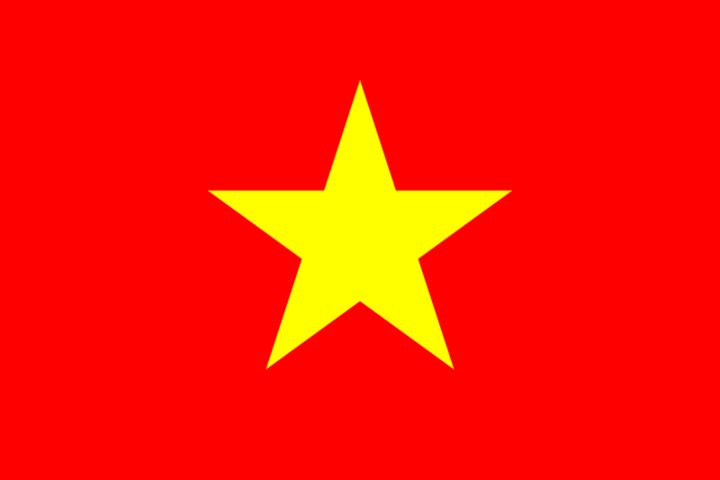 1945 - Ho Chi Minh declares independence for Vietnam. 1950 - First U.S. military advisory sent to advise French in Vietnam. 1953 - Dien Bien Phu occupied by the French Army. 1954 - Viet Minh defeat French army at Dien Bien Phu. 17th Parallel divides Vietnam (DMZ), two governments are formed the North Vietnamese communist government and the South's Republic of Vietnam (RVN). 1959 - Communist supporters in South Vietnam working in conjunction with communists in North Vietnam create the Ho Chi Minh Trail to support troops and transfer supplies. 1960 - Communists form National Liberation Front in South also known as the Viet Cong. 1961 - Kennedy becomes 35th President of the US, and promptly increases economic and military support to the RVN. 1962 - Military Assistance Command Vietnam (MACV) established in South Vietnam at Saigon. 1963 - U.S aids in the coup that kills Ngo Dinh Diem, and troop strength reachs 16,000 servicemen. (Nov. 1). 1964 - North Vietnamese torpedo boats attack U.S. naval vessels in international waters at the Gulf of Tonkin. Gulf of Tonkin resolution passed by Congress. 1965 - Operation Rolling Thunder proceeds with sustained bombing missions. First U.S. Combat troops arrive. 1966 - U.S. forces reach 385,000 servicemen, Operation Crimp largest U.S. operation of the war to capture the Vietcong's headquarters for the Saigon area, but fails to find it. 1967 - South Vietnam National Assembly elects Nguyen Van Thieu as president, U.S. troop strength level reaches 485,600 servicemen. 1968 - During the Tet offensive, Viet Cong guerrillas attack Saigon, Hue, trying to incite South Vietnamese to join them . Peace talks begin in Paris. 1969 - U.S. troop strength reaches high at 536,100 servicemen, President Nixon makes peace offer, North Vietnamese forms Provisional Revolutionary Government. Large demonstrations in U.S. protest war. 1970 - U.S. begins missions into Cambodia. Shootings at Kent State demonstration. 1971 - ARVN troops, along with U.S. air forces, defeated in Laos thrust. Troop strength decreasing as more troops are sent home. 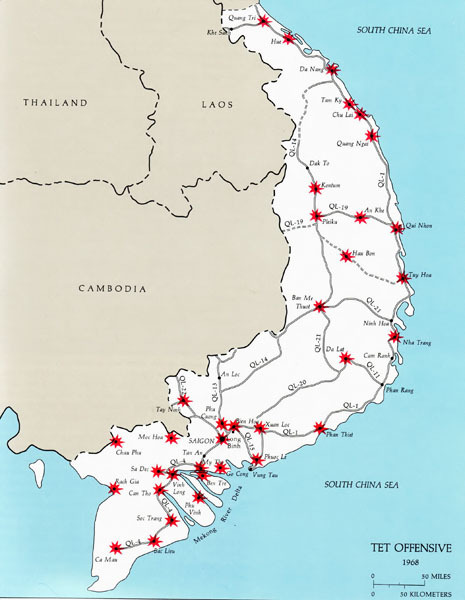 1972 - North Vietnamese drive across DMZ capture major cities and provinces in South Vietnam. President Nixon orders new bombing missions of Hanoi-Haiphong area. 1973 - President Nixon orders end to all offensive operations in North Vietnam. Cease fire signed in Paris. 1974 - Both sides bring accusations of violations of the cease-fire signed in Paris. South Vietnamese forces pushed back due to lack of training, supplies, and support. 1975 - Full-scale warfare resumes in blatant disregard of the peace treaty with no U.S response. South Vietnamese government surrenders to North Vietnam. Remaining civilians and refugees airlifted out. An indepth website dealing with the Tet Offensive and it's aftermath, including pictures and a recount of the 30th anniversary of the Tet Offensive is Vets With A Mission. A breakdown of the Tet Offensive, key players, battles, and analysis is Wikipedia: The Tet Offensive. An interesting news article from a different point of view about the General Offensive and Uprising can be found here. Interviews, TV broadcasts, and articles dealing with the Tet Offensive and other Vietnam related items from NPR. A look at the Tet Offensive from the point of view of the Military Police who fought in it. www.u-s-history.com is a travel and history site that gives a good review of the Tet Offensive with additional material for the Vietnam War as well. Mahalo has a very comprehensive list of research links, blogs, and a good timeline. A website that has a collection of anything related to the Vietnam war from white papers to videos is The Vietnam Center and Archive. A good overview of the Vietnam War with a chronolgy, and military breakdown of the war is PBS sponsored :Battlefield Vietnam. For many different multimedia materials to use, History.com is an excellent source to research different aspects of the Vietnam War. General William C Westmoreland was the commander of the U.S. MACV. President John F. Kennedy increased U.S. support in Vietnam and also sanctioned the overthrow of Ngo Dinh Diem in South Vietnam. President Lyndon Johnson expanded the U.S. role in Vietnam after the Gulf of Tonkin incident. President Richard Nixon introduced the Nixon doctrine (Vietnamization) and secret bombings into Cambodia. Ho Chi-Minh was the leader of the North Vietnamese. Vo Nguyen Giap was the General of NVA during the Tet Offensive. A book that focuses on the effects of the Tet Offensive on U.S. Policy and U.S. civilian populations is The Tet Offensive: A Concise History. by James Willibanks (Columbia University Press). Another excellent source of material was Tet! : The Turning Point in the Vietnam War by Don Oberdorfer (JHU Press). This book took a look at the thoughts of leaders from both sides, and the political causes and effects of the Tet Offensive. For a look at the point of view of the media and it's role in the effects and after effects of the Tet offensive read Big Story: How the American Press and Television Reported and Interpreted the Crisis of Tet 1968 in Washington and Vietnam by Peter Braestrup (Yale University Press). For a great reference tool for anything dealing with the Vietnam war read The Vietnam War Almanac by John Bowman (Barnes and Noble).